It’s funny, I feel a bit shy popping my head back in here after all this time… but there we have it. I’m back on my feet and intending to breathe life back into this blog. Life went a little pear shaped for us back in May on a couple of fronts but the upshot is that we are now settled into our own little postwar cottage in North Brisbane, and loving the Queensland lifestyle. There is quite a lot of murraya hedging around this property, some of which I feel could be replaced with the gorgeous silver-grey foliage of sellowiana. It’s on the future projects list. What’s been curious is that the feijoas keep finding me, here in the ‘burbs. A couple of streets away – on a jaunt to the local supermarket – I have discovered a house with three feijoa trees in the front yard. It was so surprising, that I stopped and looked and looked again. Unmistakable. It’s a bit of a gardener’s delight, that property, with many unusual and exotic fruits and I would love to have a chat to the green thumb who lives there. As well, we’ve discovered the best little IGA in the whole of Australia*, a few suburbs away. Aisles and aisles of kiwi fare: rice risotto, instant pudding, chow-chow, spam… (oh, the memories, good and bad)… and all those things that are not good for the hips and teeth: eskimos, jet planes, jaffas, pineapple lumps, milk bottles (the real ones), K-bars, Whittakers, etc. 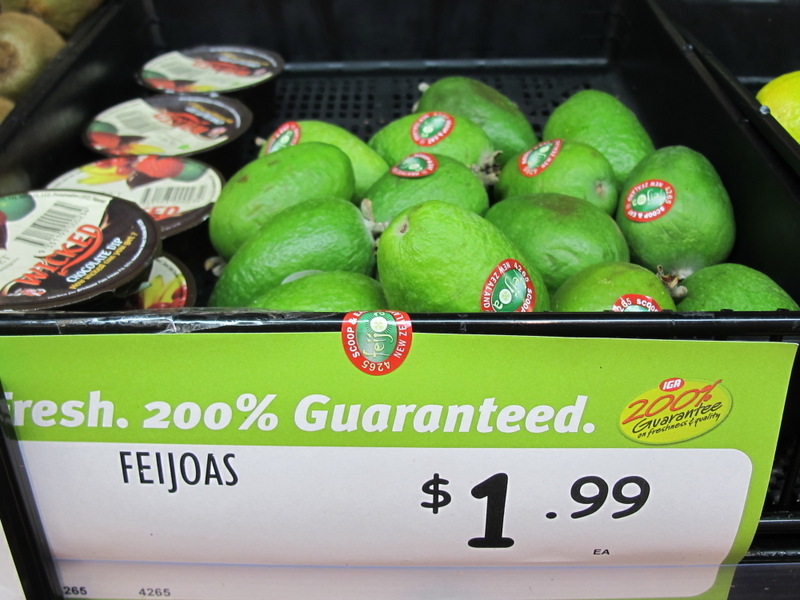 Of course, it wouldn’t be a real Kiwi delicatessen without… feijoas. Real feijoas (this was back in May), very nicely placed next to the Wicked Chocolate Dip… so tempting except for that price tag. That’s EA. $1.99 each. Ouch. 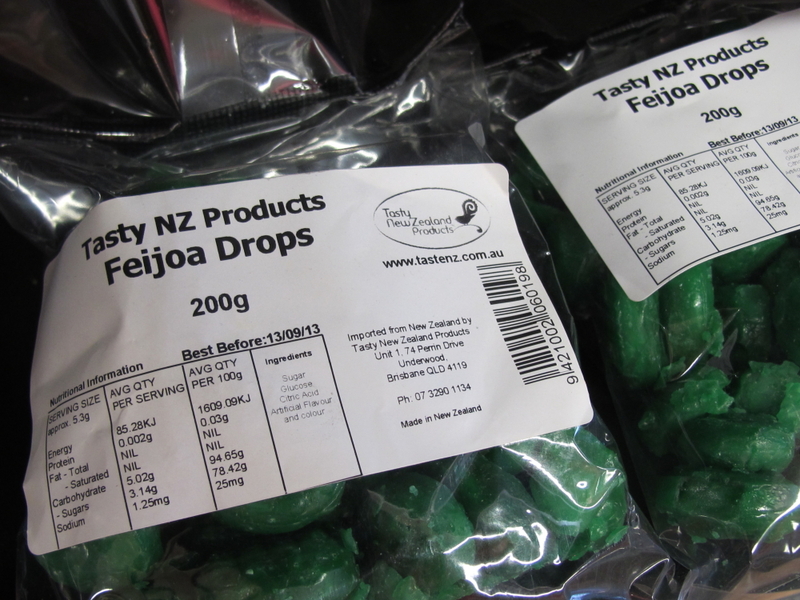 And feijoa lollies. Sad to say I didn’t try these either, only because the label says artificial flavour and colour, and I have become a little bit wary of how far food science is taking us away from good food, especially when my child is demanding some. But they’re there if you’re local and need a fix.